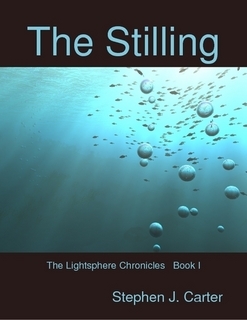 "The Stilling" is a glimpse into a terrifying future - a future in which a biomass 'stilling' spreads its malevolent sheet across the oceans and much of the landmass of Nebura. Six survivors join forces with a scientist to unravel the mystery of this environmental attack. Pursued by hostile Siqdori forces, they take the fight to the one remaining stilling-free sector - Polarica. They know they will have only one chance to save themselves ... and the planet. Neither the survivors nor the Siqdori are prepared for the unique role the 'lightspheres' will play. She felt herself shoot forward into the sphere. Her whole body was inside. She floundered and suddenly realized she couldn't see the sky, in any direction. She knew a moment of pure terror. All she could see was a bright concave surface of water, all around her. She willed herself to be still, it felt like a surreal version of a space-walk, water-droplets were spooling off her skin in every direction; she was in a shower of suspended drops, which were gliding back towards, and flowing into, the globe of water that enveloped her. Then the terror returned - she was shocked into rigid immobility by its size.